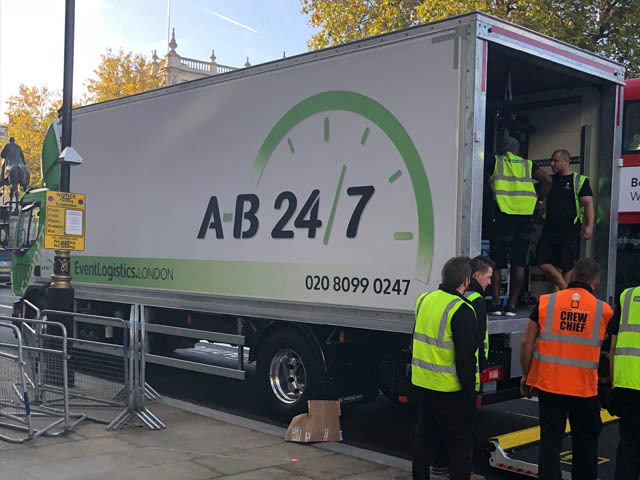 Based in London, the A-B 24/7 Event Logistics team understand the realities and complexities of the Event Transportation industry. Our extensive experience allows us to deliver a reliable and professional service. • … and many other events. Our management team are your partner to plan the logistics for your next event. Our considerable transport experience allows us to ensure everything arrives where you need it when you need it. Event Transport for London and the UK… we’ve got it covered! From our Head Quarters in Wimbledon, London SW19 our event transport fleet has quick access to central and greater London. The transportation routes via the M25 allows our vehicles to easily reach any destination across the entire UK. We regularly transport goods to all the major UK cities. Please contact us for information if you are planning an event anywhere in the UK. Our large trucks head our fleet with their range of capacity and are complemented by a large range of event transport vehicles to suit any event. If our large capacity trucks are too big then we also have a fleet of event vans with a range of carrying capacities. 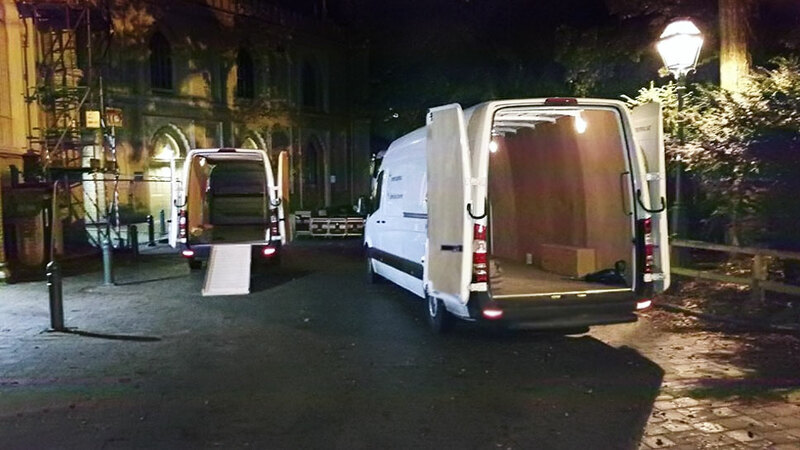 Our event vans are ideal if you need to collect from multiple destinations, and are especially handy to navigate through congested and narrow city roads. Our Event Transport fleet is available 24 hours a day, seven days a week throughout the year. We are always here when you need a professional team to support your event. Our directors oversee all aspects of our work to maintain our values of customer service. All our drivers are hand-picked and trained to the highest driving and customer care standards; at the end of their training, they understand how we do things. We are a close-knit team and demand and accept only the best. All our vehicles regularly maintained and kept clean. We provide transport support to specialist event supply/hire companies; we make ourselves available when their own vehicles are busy. All our Event Transport vehicles are fully-equipped. Our controllers work from our London head office. All our vehicles tracked using the latest GPS technology. As well as monitoring progress we can look at the road ahead. We notify our drivers of any developing traffic situations. Our clients can relax knowing we have everything in hand and we take the greatest care with everything we do. We appreciate that having vehicles where they are needed and on time is a priority for any event. But equally important is that the items we transport on your behalf arrive safely. All our drivers are hand-picked and trained to the highest driving and customer care standards and know how to handle large, delicate and fragile goods. Our vehicles are specifically equipped with straps and padding when required to ensure goods are secure and don’t move in transit. We are an independent business and we know our reputation is our best endorsement. For us, every delivery is important. If your business is planning an exhibition, setting up a performance or supplying an event we’re always here to discuss your Event Transport requirements. Call A-B 24/7 Event Logistics team on 0208 0990 247 or drop us a line via the contact page. Planning, exhibiting, performing or supplying an event?